Local Flair is back, and this time I had the pleasure of meeting Chirin Khawatmi, owner of the innovative Mama’s Box. Chirin guarantees to send out boxes that will bring a smile to mama and baby, as each box is packed with hand-picked items to suit you and your child’s needs at that particular age or time of pregnancy. The best part is that each box is sealed with a unique handwritten note written by Chirin. How adorable is that! Mother of two, Chirin is originally from from Syria where she completed high school and moved to Germany to study for her under graduate course. She moved to Dubai five years ago to complete her Masters degree after which she got married and began work at Jhonson and Jhonson, all in quick succession. Having worked at Johnson and Johnson for over a year, Chirin quit her job once she became pregnant and delved whole heartedly into motherhood. Chirin and her husband were happily surprised with another pregnancy soon after their first baby boy, this time giving birth to a baby girl. 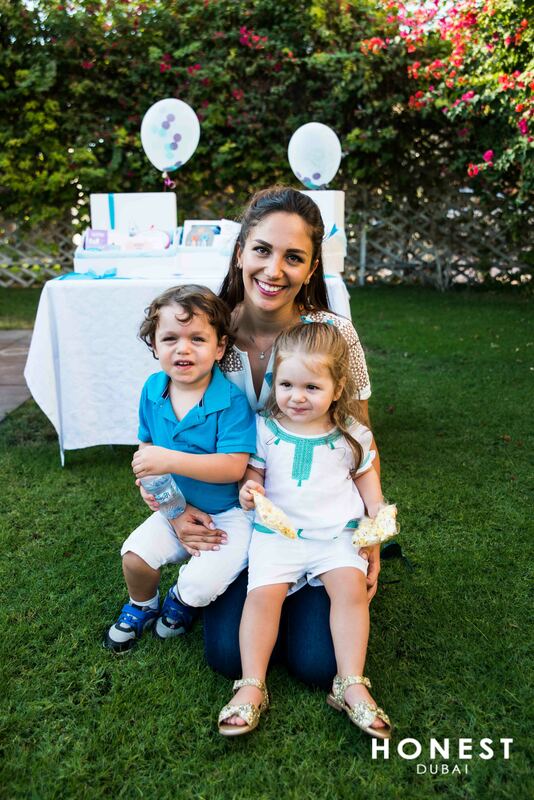 Her children are currently two and three years of age, full of energy, and the passion behind Mama’s box. During pregnancy, especially her first, Chirin found herself trying to find answers about questions related to her pregnancy and once her babies were born, even more questions about the different stages of their developments. Since she had no immediate family surrounding her, it was difficult to get a hold of advice and information that is necessary for all mothers and mothers to be. Six months after giving birth to her second child, Chirin decided it was time for action. Since subscription boxes are all the rage right now (and she was already subscribed to GlamBox), she decided to merge the concept of supporting mothers and mothers to be with a subscription box, and thus the idea of Mama’s Box was born. Chirin describes that her “heart skipped a beat” when the idea first revealed itself in her mind, and she was very excited to relay the idea to her husband that evening when he returned from work. With her husband’s full support, Chirin began making notes upon notes for the next few months and in November 2014 Mama’s Box was launched! For Chirin, this would have to be the letters, emails and whatsapp messages she receives from happy clients, which is a common thing even a year on, and even now it brings just as much happiness as the first message did. Chirin very kindly read out a whatsapp message to me which stated that the box had brought tears (of happiness) to the eyes of a mother that was gifted the Mama’s Box, and this is the kind of achievement that Chirin is striving for. What a special feeling that must be! Managing time is perhaps the most difficult part that comes with being the owner of Mama’s Box. Chirin told me how she has so many ideas for the business to expand and make it better, however her kids are her priority. She is hoping to utilise the time she will get once her youngest child starts nursery in April to make these dreams and ideas a reality, but until then she will be treasuring every minute spent with her baby girl. Another challenge is that of including a hand-written note in each and every box she sends out to her clients. Chirin explains that each note is written solely for the person the box is addressed to and has a lot of thought put in to it. She admits that there have been times when she felt she should simply type up the message or include one at all, yet she realises that the hand written note is often the best part that the mothers cherish, as it adds the most personal touch to their box. Chirin is soon hoping to start hiring as her business expands, which should lessen the workload and provide new inspiration. The great thing about sourcing products for Mama’s Box, Chirin exclaims, is that there are “no limitations”. Well, apart from the size and price of the item which must conform inside the box, products are included from all around the world and currently there are pieces from Australia, United States, United Kingdom, as well as locally. Mama’s Box contains products from big well known companies as well as handmade items from new businesses, many of which are mompreneurs. Chirin is very proud to give a platform to expose mompreneurs and small businesses, and selects every item on the basis that all mothers will find it enjoyable and helpful. This was a tough one for Chirin as she began listing out all the great things a newborn baby offers in their first year of life, including your baby’s first smile, weaning, and when they begin to communicate through their expressions. When pressed further, Chirin finally decided that her favourite was when the newborn is 9 months of age and begin to express themselves with emotions and are ready to interact through play. I am wondering whether this question made her feel broody all over again, and my guess is probably yes! Chirin’s day begins bright and early at 6.30 am thanks to her children. “It used to be 5.30 am”, she laughed! Once the kids are up, she lets them play together until she fixes herself some breakfast and packs, her son, Tarif’s lunch for nursery. Once everyone is ready, Tarif leaves with her husband and Chirin dedicates her morning to Tia, her daughter, by taking part in some kind of activity where both of them can bond and enjoy themselves. The afternoons call for meetings when Chirin utilises the time of her daughter’s nap time by working on Mama’s Box. In regards to balancing family and work, Chirin explains that she devotes one day a week solely to spend with her daughter. If there is a day where she has had to be working non stop, she makes sure she makes up for it the next day. Therefore, along with the help of nannies, scheduling her time appropriately and having the full support from her husband, Chirin is able to balance her family and her business. “I love music. I can not be alone without music playing in the background”. I suspect most of us are the same! “If you believe in your idea, then go for it!” Chirin explains that there is great danger amongst mothers known as “Mum’s Guilt” and boy, don’t we ALL know it! She believes that every mother needs a form of escapism from her children to keep her motivated about motherhood, whether it be as complex as a business or as simple as cooking for yourself. Therefore if you have an idea that you feel excited about and makes your heart skip a beat, “don’t overthink it”, and there is especially no need to feel guilty. Every pregnant woman wanting a Mama’s Box is Chirin’s ultimate goal. She would like to see the business grow and expand outside the UAE and has already had offers to franchise the business in countries such as Lebanon and Saudi Arabia. Chirin would also like to bring a different range of products into the business to make life easier for mothers to be, and assures me 2016 will be a big year, filled with numerous surprises, for Mama’s Box. 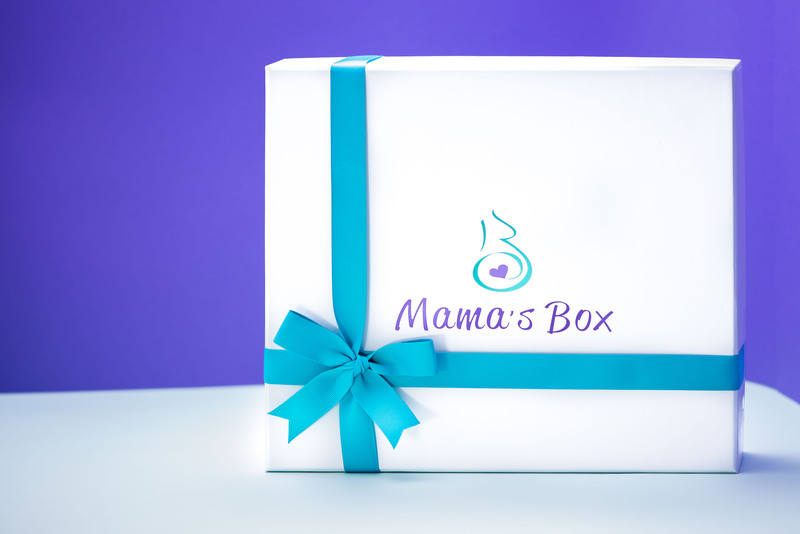 With so many exciting new projects, Mama’s Box is definitely one to look out for! If you are a mother or know a mother who needs a smile, head on over to Mama’s Box now and order your very own tailored box or subscribe through the website details given below. You can also stay up to date with their new offers and items by following them on social media. All photographs in this post are the property of Mama’s Box, and have been used by the owner’s permission. Nice article. I just recently found out about Mama’s Box and I really think this is a cool idea! Thank you, and yes, isn’t it such an amazing idea?! Yes, it really would be a great idea! Wish I could turn back the clock to grab myself a pack too! Ha! Thanks for reading! ?